I have a confession to make - I have never seen a show at Playhouse Square. I have lived my entire life in Northeast Ohio and I have never been to the theater. Crazy, right? Well, it's true, until I won tickets to see Spank! from Why Cle? and Playhouse Square! I entered her giveaway as well as Life in the Cle's in the hopes of winning and then, I forgot about it. I never win anything this cool and nothing local, ever. It was such a surprise to open an email from Jen saying that I won! I was talking to the Husband when I opened the email and he surprised me even more by telling me he wanted to go! 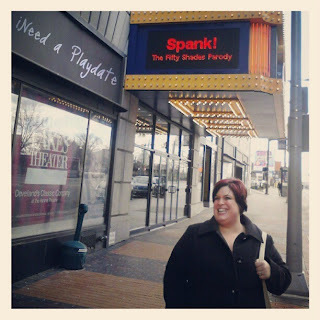 Unfortunately (or not), he had to work so I took my friend and Tuesdays with Cory contributor Cory to the matinee showing of Spank! at the Hanna Theater. I am actually glad the Husband could not go because this was the perfect girls thing that we needed to do and the show was so much fun. SPANK! The Fifty Shades Parody is an unauthorized musical based on 50 Shades of Grey but you don't need to read the books to get the tongue in cheek references. I have read them, Cory hasn't and we were both laughing ourselves silly through the whole performance. And, to say the male lead does not look fanTAStic in a pair of blue jeans would be a bold face lie. Holy crap he looked good and took his shirt off enough to justify the Chippendale's comparison that the website boosts. My only issue with the performance was the opening scene. It was this dance number with the lead characters, "Hugh Hanson" and "Tasha Woode," which just confused me as to why it was there. Once it actually started, I was able to forget the opening scene and enjoy the performance (and Hugh's nakedness) of three very talented actors. They were clever during the improv scenes and showed real chemistry on stage. It was so much fun to watch. Not ground breaking or Shakespeare but certainly a whole lot of fun! Perfect for a girls only outing. Spank! is showing until January 27 at the Hanna and the next stop is in Monterey, California. A complete list of tour dates are on the website here.